So we’ve already had a general discussion on How To Choose Your Next Cell Phone, but let’s delve a little deeper into this subject. Let’s say that you’ve already got your carrier picked out and you’ve decided that you definitely want a smartphone. Which to choose? Certain big box retailers would have you believe that this process is very complicated and you need the help of trained salespeople to decipher the specs and lead you in your quest to choose from the dozens of smartphones available right now. In reality it’s much simpler. In today’s current market you really only have 3 choices to make…iPhone, Android, or Windows. A year or two ago Windows phone would not be a contender and Blackberry would likely be in it’s place but my how things change when you are talking technology. So let’s consider each of these and see which is right for you. The iPhone is really the smartphone that led the way for the current consumer smartphones on the market today. Sure there were a few smartphones before, but none of them came even close to the features and ease of use that the original iPhone did. It really did revolutionize the entire cell phone scene. And the iPhone has made a number of changes over the last few years to keep it as a contender in the top of the line phones today. This is not to say that the iPhone is the perfect smartphone, there are a number of things that I and many others don’t like about it. Unlike Android there are a number of limitations that Apple will not allow apps to make within the phones core functions. It doesn’t really have a very good turn by turn navigation feature. The 3.5″ screen in my opinion is too small, and I really hate that it has easily breakable glass on both sides of the phone. But even with all of those negatives I just mentioned the iPhone is one of the best phones you can choose. It. Just. Works. The App store has the most apps available of any other smartphone. It is and has been for years one of the easiest to use smartphones. And as for accessories…well no other phone comes close. Because the iPhone has been so consistently popular there are apps and accessories that allow you to do just about anything you could want to do. The iPhone is not complicated, and this is something that cannot be said about Android phones. Because the iPhone is so easy to use it’s the phone I usually recommend to non-techy people. My wife is the perfect example, she is one of the smartest people I know but she is not what you would call tech savvy in the least. But she loves her iPhone. It’s also worth mentioning that a few of the negatives I discussed above may be remedied with the release of the iPhone 5 if the rumors are true. You can buy an unlocked iPhone 5 here. I’ve been a fan of Android since I bought my G1 back in November of 2008. Since then Android has only gotten better. Android is the king of customization. Because Android is open source, developers have access to the root of the phones abilities and can have it do pretty much anything you can think of. And with Android you have the choice to select a smartphone with a physical keyboard, something that is not available with iPhone or Windows phones. You have different screen sizes you can choose from, everything from 2.55″ all the way up to a whopping 5.3″. So with Android you have choices, maybe a few too many as this has also led to the problem of fragmentation. I don’t believe it’s as much of a problem today as it was a year ago but you may find that certain apps may not run on all phones. Another choice that you have with Android is whether to choose a device with pure Android on it or a version of Android that has been customized by the manufacturer. When Android was first released this served a valid purpose, to supplement lack that pure Android may have been missing. But that’s not really the case anymore. Android 4.0 is really the best version of the OS that you can have, but manufacturers still insist on customizing Android with their own skin. If you are the type of person who wants the latest OS updates and releases you will want to choose one of the Nexus devices…currently the latest being the Galaxy Nexus. These devices are designed and built with the manufacturer working closely with Google and always run pure versions of Android. They are also the first devices to receive any OS updates or revisions. 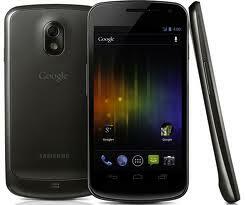 Android phones are best for more tech savvy users, people who like to tinker with their phones. Android can do pretty much anything that iPhone can do and more, but with those abilities comes a little more complexity. This is not to say that regular consumers will not be able to use Androids, but they will be less satisfied and more frustrated when they can’t figure out how to do something that could more easily be done on an iPhone. You can find an unlocked Nexus 4 phone here. The final option you have to choose from are the new Windows Phone 7 phones. Microsoft redesigned their newest mobile OS from the ground up and it shows. The interface is simple and quite beautiful. Unfortunately I have the least experience with the Windows Phones but what I’ve seen so far I really like. I’ve recommended this phone to the same crowd who might like the iPhone, those who want an uncomplicated phone experience. Like Android the Windows Phones are made by a variety of manufacturers, but unlike Google, Microsoft provided a set of guidelines that manufacturers were required to stick to in order to use the OS. What’s really amazing is when you compare the specs of Windows phones to that of Android or even iPhone you may be surprised at how inferior they may appear to be. But Microsoft designed the OS to run smoothly on less beefy hardware. The best Windows Phone available right now is the Nokia Lumia 900. This is really a beautiful phone and I’d love to have the chance to review. The only drawback I see to Windows Phones right now is the lack of available apps. Last I heard there were about 70,000 apps available…which sounds like a lot! But when you compare that to Apple and Android who each have hundreds of thousands of apps you can see that it’s still lacking. There are still major apps like Audible and Instagram to name a few who are still missing from the Windows Phone marketplace. 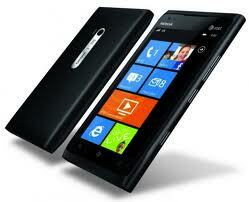 But even still I think that Microsoft is a definite contender and would make a great smartphone for some people. You can find an unlocked Nokia Lumia 900 here. So there you have the major choices. 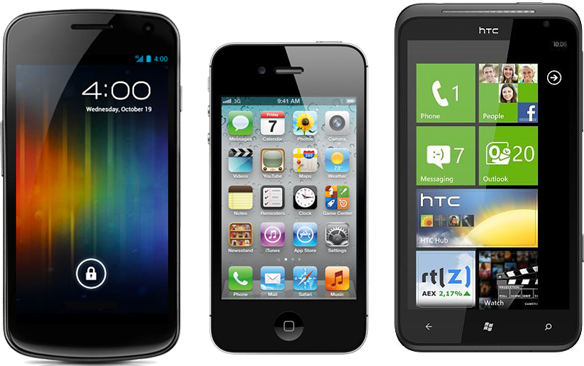 Once you know which mobile OS you want you just need to select the best phone available. With iOS that’s simple, you only have one choice. With Android and even Windows Phone series prepared to be a little frustrated. Because new phones are coming out all of the time. You really should pick the latest and best phone that is available and try to be content with what you’ve selected. My last bit of advice comes from my earlier post on selecting the phone that’s right for you. Go to the store and try them out, play with them as much as you can in store, or when your friends get new phones ask them if you can check it out. When you do buy a new phone keep all of the packaging in case you change your mind. Different states allow for different return policies but in California you have 30 days. If you find you aren’t happy take it back and choose something else! These phones usually come with a commitment and you really want to be happy with whatever you select. I just bought a MacBook Air. On-line I use google products. Should I get an android to mate with all the google stuff or an iphone to be go with the new putter? I don’t use my phone all that much and might stick with the old cell to save the money. But if I do spend and get a new phone. which will work best with what I have? With the latest update to the Mac OS, Apple is really trying to tie in the whole OSX and iOS universe together. So if you relied on your phone alot I’d say it may be a good idea to look at the new iPhone coming out next month. But in reality either Android or iPhone both work well with Google’s online services. The iPhone still works pretty well with Google products but Apple is slowly trying to untangle itself with them as much as possible but it’s going to be impossible to totally cut the cord. If you’re heavily invested in Google’s services Android may have some advantages.